Apocalypse Survivor Assisted Opening Pocket Knife | BUDK.com - Knives & Swords At The Lowest Prices! There’s no need to fear the zombie Apocalypse as long as you are equipped with this Apocalypse Survivor assisted opening pocket knife! Got this for my survival kit, and to my surprise it was sharp out of the box. Great bargain. Nice knife, I bought one for myself and each of my older boys. Good addition to the bug out bag --- cool color too. Nice knife very sharp, bought several gave it as gift to my walking dead viewing friends. And they love it. 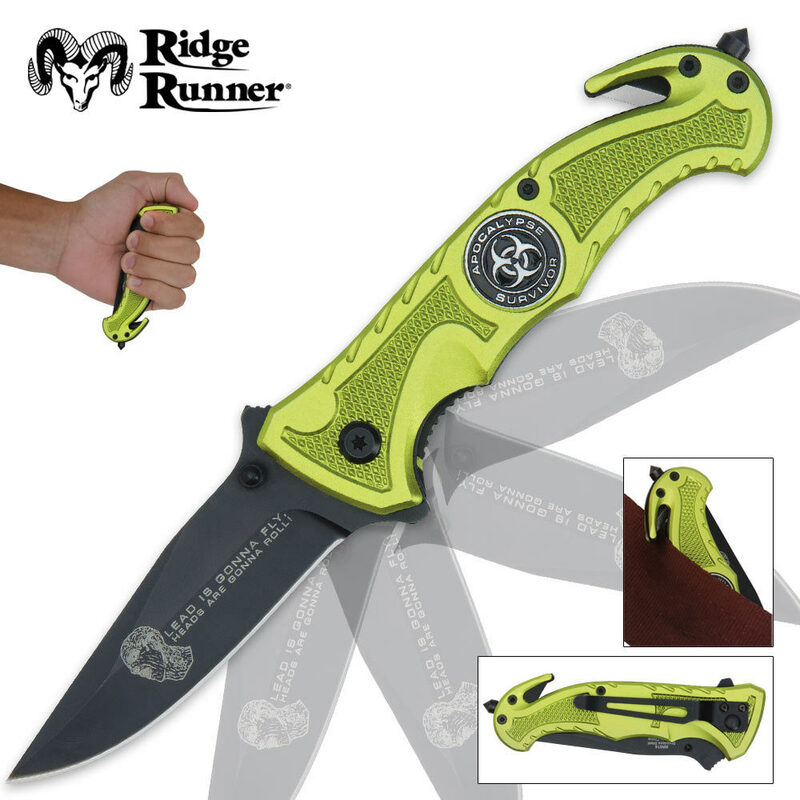 Great knife.I love the color and its razor sharp right out of the box. You cannot beat the quality and the price is unheard of. It was so nice and so reasonable, I bought extras to give as gifts. This knife is a HUGE bargain. thought the blade does occasionally get lose, that is easily fixed by tightening the bolt. I carry this knife everyday and enjoy how well it fits my hand and its ability to hold a sharp edge. I would recommend this knife to anyone who wants a good blade for a low price. Thanks BUDK! I absolutely LOVE this knife. I love it so much, that I bought multiples of it so I would always have one in the future. I gave one to my son, keep one on me at all times, and the rest are put away in case they stop making it, I will always have one! Great knife. Came decently sharp. Assist open is great. A little big. Pro: Came Sharp Con: Shipping Costs and took to long to get here. Would I recommend this knife? Yes. I was impressed with this product, all the features seem to work well, did not test the glass stud. Bought this to have as an emergency tool in our Jeep and I am sure it will serve long and well.